This is the second of a short series of episodes on issues related to divorce. The first was our “All Joy and No Fun” episode, where we talked about how parenting today can be the most joyful thing in our lives – even if it isn’t always a whole lot of fun from moment to moment. Well, I didn’t, but when I started looking around I realized there’s actually so much of it that it makes sense to break it down into two episodes which is what we’re going to do. So today’s episode focuses very much on the factors leading to divorce and the impact of divorce itself on children, and the final episode in the series will look at how what happens after divorce – things like single parenting, ongoing contact with both parents, ongoing arguments between parents, and remarriages and stepparents impact children. Other podcast episodes mentioned in this show: 020: How do I get my child to do what I want them to do. Hello and welcome to the Your Parenting Mojo podcast. Today’s episode is another that comes to us via a question from a listener, and it’s the second in our three-part series on how the adult relationships in a family affect the child. We kicked off a couple of weeks back with an episode called All Joy and No Fun, which is about the book of the same name and discusses how parenting today can seem very joyful when you look at it as a whole thing, but if you ask yourself during an average moment with your toddler or preschooler whether you’re having fun, I think many parents might say ‘no.’ And I don’t mean to suggest that having all joy and no fun is a leading cause of divorce but it could certainly be a contributing factor, and that’s our topic for today. The listener who sent me an email said “I was divorced when my husband was 2 ½ years old. He is now 5 years old and has a very hard time expressing his feelings. I have an intuitive “gut” feeling that it has to do with the fact that he went from being with me every day (I was a stay at home mom) to suddenly spending 7-10 days away from me and with his father, and also away from me as I set up a career. Do you know of any research on this?” Well, I didn’t, but when I started looking around I realized there’s actually so much of it that it makes sense to break it down into two episodes which is what we’re going to do. So today’s episode focuses very much on the factors leading to divorce and the impact of divorce itself on children, and the final episode in the series will look at how what happens after divorce – things like single parenting, ongoing contact with both parents, ongoing arguments between parents, and remarriages and stepparents impact children. I also want to say before we get going that I have no position on whether or not you should get divorced if you haven’t already done it, or whether your divorce was a good thing or not (if you have); I’m not arguing for divorce to be outlawed in the interests of our children or that we should all try it once just to see what it’s like. I have nothing against divorce – I’ve done it myself, although not with children involved – but I’m also not going to try to persuade you to stay in a marriage. 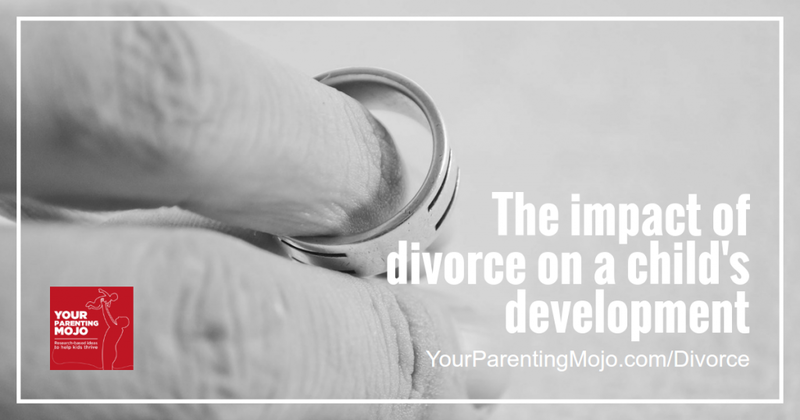 My goal here is simply to help you to understand the impacts of divorce on a child’s development so you can better support that child through the changes that might one day happen or have already happened in your family. Throughout this episode we’re going to examine a number of factors at play when we talk about divorce and the impact that these have on a child’s development, but the one idea I want to leave you with (and so I’m going to tell you about it now so you can keep it in mind as you’re listening) is that the research paints a picture of a series of risk factors that exist in the child, the family, and the larger society that make a particular child more or less vulnerable to the kinds of disruption that occur through divorce. These risk factors interact in ways that aren’t always expected; we might see some children with a lot of risk factors who sail through a divorce and adjust relatively well afterward. And there are others whom we might expect to do fairly well who fall apart after a divorce and have a hard time recovering. But the one that seems to be more important than all the others is the quality of the parent’s – and particularly the custodial parent’s relationship with the child, and whether that is warm and loving while setting and maintaining appropriate limits. So let’s dive in. California enacted the first modern no-fault divorce law in 1970 which, for those who don’t live in the U.S. is the idea that you can get divorce just because you want to, without having to prove that one party was at fault – by committing adultery or abuse or something like that. Popular wisdom says that the divorce rate has skyrocketed since then, although actually it has slowed down over the last twenty years. There’s a nice graphic on it in a New York Times article that I’ll link to in the references which shows that about 70% of marriages that began in the 1990s reached their 15th anniversary (excluding those in which a spouse died), up from about 65% of those that began in the 1970s and 1980s, and those who married in the 2000s are so far divorcing at even lower rates. The Times cites later marriages, birth control, and the rise of so-called “love marriages” as some important factors in the drop in the divorce rate. In some states (including Louisiana, Arizona, and Arkansas) couples can *choose* to have a “covenant marriage,” which can only be divorced under fault-based circumstances, although only about 2% of couples in Louisiana opt for it. Nevertheless, politicians and family activists continue to advocate for the modification or repeal of no-fault laws, and the rhetoric around this tends to focus on how divorce affects children, although it tends to take a simplistic view along the lines of “divorce leads to single parenting, and single parenting leads to an increased juvenile crime rate and costs taxpayers a lot of money in the form of welfare subsidies. The breakdown of the family is a result of no-fault divorce laws, which must be repealed.” We’re going to take a bit more of a nuanced view today and examine what really are the impacts of divorce on a child’s development, as best as science can help us to understand them at the moment. What is fairly well understood is that the children of divorced parents have, on average, more behavioral and emotional problems than children in intact families – but the reasons for this are quite complicated. The first thing we’re going to look at is the idea that divorce is not a single event in time, with the child being fine before and falling apart afterward; people tend to divorce because of longstanding problems that may have been simmering (or boiling) for months or years; there may have been one or more separations within the marriage, and even after the legal divorce has occurred there are still ongoing negotiations and transitions. It is also possible that “difficult” children can put stress on a marriage and may contribute to parental conflict that eventually precipitates parental separation, but it’s very hard for researchers to untangle these factors and say how much of the negative behavior they see in the child after the divorce might have been caused by the divorce itself, and how much preceded it. Many researchers believe that the interparental conflict that precedes the divorce (and, in many cases, follows it as well) is a very important variable related to the child’s adjustment to the divorce – in fact, it might be a more important factor than the divorce itself in regard to child behavior problems, particularly aggression. Some studies suggest that the frequent expression of parental conflict appears to be more strongly associated with childhood aggression than the absence of the father. This becomes especially problematic when the divorce itself becomes a drawn-out conflictual process, particularly where one parent doesn’t want to disengage from the relationship and sees an ongoing conflictual relationship with the spouse as preferable to a complete disengagement. What looks on the surface looks like a custody dispute may actually represent the efforts of one or both of the spouses and remorse about the dissolution of the marriage, and the custody dispute becomes the vehicle that one partner uses to serve as an avenue that one partner uses to remain in contact with the other. The extent to which one member of the couple is unable to disengage from the relationship is associated with increased problems in their post-divorce adjustment, particularly depression. Contrary to popular belief, parental conflict doesn’t always decrease following divorce and may actually increase. One study found that 66% of the exchanges between ex-spouses two months after a divorce were conflictual, mostly related to finances, visitation, childrearing, and intimate relations with others. But many couples do manage to have a nonconflictual relationship after the divorce and several studies have found that children from relationships where conflict is avoided or at least quickly resolved have fewer problems than children from high-conflict divorced families. Other studies have found that it isn’t necessarily the presence or absence of conflict per se that it’s important, it’s whether or not that conflict occurs in the presence of the child that is associated with the most detrimental effects on children. So the take-home message here is fairly simple – try to avoid or quickly resolve conflicts with your spouse, and at the very least, don’t fight in front of your child. The second major factor is the adverse impact that divorce tends to have on family finances, and particularly those of the mother. The U.S. Census bureau actually puts out some nice statistics on this issue, although unfortunately the most recent ones available are from 2007, and were published in 2009. 83% of mothers receive custody of their children in divorces, proportions that were statistically unchanged since the government last published data in 1994. Just over three quarters of custodial parents who were due support received at least some payments in 2007; 47% got the full amount and an additional 30% received some support. Child support represented almost half of the average income for custodial parents below poverty who received full support. One quarter of all custodial parents had incomes below poverty, while 18.2% of those who received some child support payments were below poverty; the overall poverty rate for the total population in 2007 was 12.5%. The poverty rate of custodial mothers actually fell from 36.8% in 1993 to 27% in 2007, which is something to be thankful for, although it is still more than double the poverty rate for custodial fathers, at 12.9%. Custodial parents who are under age 30, black, or never married tended to have higher poverty rates (of 35%) than older, non-black, formerly married people. Custodial parents with full-time, year-round employment had a poverty rate of 8.1% while custodial parents who didn’t work or were participants in public assistance programs had poverty rates of 57% in 2007. Even among parents who are doing relatively well financially when they’re together, the expense of maintaining two households virtually guarantees some decrease in the family’s standard of living. The reason all this economic information is important is because socioeconomic status is a key indicator of post-divorce adjustment. Low income has been shown to predict anxiety and depression among preschoolers from both divorced and intact families. Other researchers have shown that it’s the change in socioeconomic status after a divorce that’s very important. Girls seemed to fare especially poor psychological adjustment when the income of the custodial mother was much less than the non-custodial father, whether that resulted from a drop in the mother’s income or an increase in the father’s. And why is socioeconomic status linked to poor adjustment outcomes? Well, there are a variety of reasons. Parents who have more money are able to offer their children more privileges than parents with more meager family incomes, which provides children with the opportunities to achieve social competency and personal goals. It’s also possible that the drop in income might necessitate a move to a new neighborhood, perhaps with more affordable housing and schools of lower quality. Fitting in at a new school can be hard under the best of circumstances, but fitting in at a new school you’re your whole life is being turned upside down makes everything more difficult. Parental divorce, parental income, and school quality have all been shown to affect eighth-grader’s achievement test scores. Doing poorly in a new school, particularly a new school in a not-so-good neighborhood that might not have much in the way of support sets a child up for potential missed educational opportunities, which can even become a factor a child’s deviant behavior, timely high school graduation, premarital fertility, and possibly the child’s own early marriage and possible following divorce. Socioeconomic status also impacts the mother’s psychological adjustment, which is a key predictor of the child’s psychological adjustment. In other words, if the loss in the mother’s household income causes the mother to feel depressed, her ability to provide effective, authoritative parenting may be compromised which can lead to poor adjustment outcomes for the child. Regarding which gendered child is more severely impacted by divorce – a variety of studies have shown that boys are more severely impacted by divorce than girls. Another variety of studies have shown that girls are more severely impacted by divorce than boys, and a third set shows no gender differences in children’s adjustment to divorce. The one thing that does seem fairly clear in all of this is that you can design a study that will show that either boys or girls or neither are most severely impacted by divorce. It is possible that boys more often respond with externalized responses (like aggression, school behavior problems, and stealing), and girls may respond by demonstrating anxiety and withdrawal – which may not even be noticed by teachers and parents but may have more serious implications for long-term adjustment than the externalizing behavior problems exhibited by boys. The age of the child at the time of the divorce may also be an important factor, and many studies have been done on this, with mixed results from which we can still draw some conclusions. Overall, the research suggests that divorce has a particularly negative impact on very young children, and that the impact is less if the child is a teenager when the divorce occurs. Children whose parents divorce in the preschool years will be acutely aware of the departure of one parent, and will fear the possibility of abandonment by the other parent which may be manifested in extreme anxiety when the child is temporarily separated from the custodial parent. The child may become very clingy and unwilling to go to daycare or preschool when they were previously happy to go. They may also see bedtime as a separation, and may experience terrifying nightmares. They may experience disruptions in their normal ability to resolve inner conflicts through play and fantasy, or may even stop playing altogether. They might be restless, noisy, and irritable. Very young children might experience a loss of recently acquired motor skills, and because slightly older children can’t fully understand the circumstances that led to the separation, they may blame themselves for the divorce, and even think that they themselves are not worth loving. Some children will concoct elaborate reconciliation fantasies, where they believe the departed parent has gone on a trip and will soon return, and it may be impossible to convince the child that this is not the case. Unfortunately, we also see that problems in adjustment of young children may be sustained or even appear for the first time in adolescence, which can trigger behavior problems in children of divorced parents who had appeared to be functioning pretty well up to that point. There is about a twofold or greater increase in problems like delinquency, teen pregnancy, truancy, school dropout, and substance abuse in teenagers whose parents divorced some years previously. Later on, these problems may include problems with the workplace and with family and spouses, more behavior problems, lower socioeconomic status, and lower reported well-being. A researcher called Nicholas Wolfinger at the University of Utah wrote a whole book on what he calls the “divorce cycle” – he found that the reduced educational attainment that can result in growing up in a non-intact family is strongly associated with the child’s own divorce later in life. The main reason for this seems to be that children from divorced families exhibit a variety of problematic interpersonal skills that make it difficult to sustain a relationship, including getting angry easily, having their feelings hurt easily, jealousy, won’t talk to the spouse, can’t calmly discuss disagreements, unccoperativeness, and hostile passive behavior. Three studies have linked parental marital conflict with offspring marital conflict, and we already saw that conflict in a marriage has a negative impact on a child whether or not a divorce ultimately occurs. Some researchers have tried to understand whether children from divorced families marry earlier than children from intact families, and Nicholas Wolfinger realized that you really have to disaggregate the data to get a clear picture of what’s going on. The children of divorce do have high rates of teenage marriage, but if they remain single past age twenty, their ultimate chances of marriage dip below those of adults from intact families. Strangely enough, children of divorce actually don’t report lower levels of happiness in their own marriages than children from intact families, but researchers explain the reason for this as being because the children of divorce must have a different understanding of happiness than children from intact families. The children of divorced families more often say that their marriage is in trouble than children from intact families, even when the child from the divorced family is happy in that marriage. Marriage does seem to be a very different experience for children of divorce than children from intact families. When one child experienced parental divorce then that child’s own marriage has about a 100% greater chance of ending in divorce, but if both spouses come from divorced families then they actually face more than a 200% greater chance that their marriage will end in divorce. A marriage is more likely to survive when only one of the two parties brings the problematic interpersonal skills that can come with being a child of divorce, but can still work out if one of the spouses was a more resilient child and was able to develop those skills even after the divorce. Given all these negative impacts on a child’s development associated with divorce, parents might be wondering if the old adage that it’s better to stay together for the children’s sake might ring true after all. In fact, it seems to depend on the children’s perception of the marriage and the stability of the post-divorce situation that determines the answer to this question. If the marriage is characterized by a high degree of conflict and the post-divorce situation is relatively stable, conflict-free, and a high degree of parenting skills are maintained, then the divorced situation tends to be preferable. But if all conflict has been hidden from the child and the child perceives the marriage as essentially conflict-free, then the child may go on to experience more psychological distress and lower overall life happiness as a young adult, possibly because of the completely unexpected nature of the separation for what may have seemed to the child as reasons that were totally unwarranted. But I do want to be sure you realize, though, that the reactions of preschoolers that I’ve described are neither uniform nor inevitable. Not all children of divorce will exhibit these problems – far from it; when we talk about doubling a certain risk for children of divorce we’re talking about doubling a fairly small chance to begin with. The majority of children of divorced parents are resilient and grow up into adults who are fairly well-adjusted. A researcher by the name of E. Mavis Hetherington studied divorce for many years before her retirement from the University of Virginia, and she was instrumental in developing what is known as the risk and resiliency perspective of children’s adaptation to divorce. The basic idea is that an individual child has certain risk factors that come from factors within the child him- or herself, like an irritable temperament or the child’s gender, which doesn’t make the experience of divorce “worse” but does change the way in which the boy or girl experiences it, and the types of responses they might display. These aren’t deterministic characteristics, in that it’s not possible to say that all children with an irritable personality will have a certain experience, but they are aspects of the child’s genetic make-up and personality that are stable and increase the liability for adjustment problems after divorce. In addition to personal risk factors a child also has sociocultural or demographic risk factors like poverty, unstable household characteristics, living in an unsafe neighborhood, the number of stressful life events the child has faced, and parental stress and social isolation. Finally, home and family risk factors include conflict between parents (and also violence, when it occurs), conflicted sibling relationships, and parental psychopathology, including factors like depression. Dr. Hetherington found that the number of risk factors present ended up being less important than the risk factors themselves, with problems in parenting and in the home environment (so things like maternal negativity, depression, parenting stress, and the use of physical punishment) were particularly important statistical predictors of children’s adjustment, although these are correlational attributes so we can’t be sure that negative parenting techniques cause poor child adjustment; it could be that mothers parent more negatively in response to the child exhibiting difficult behavior. The child’s response to a divorce is really an interplay between the individual characteristics of the parents and children, their family relationships, as well as factors outside the family that either support or undermine the well-being of family members as they negotiate the challenges that divorce brings. E. Mavis Hetherington notes that adaptation to divorce tends to occur over a period of several years, with the first year or so representing disruption to relationships and living conditions that usually become stabilized two to three years after the divorce, which is followed by an improvement in the relationship between the parent and child and the child’s adjustment. Hetherington reports that two of the major challenges that parents face that can have a material effect on children’s adjustment to divorce are to minimize the amount of conflict that the child is exposed to, and also to maintain authoritative parenting (which we discussed in more detail in episode 20, called “how do I get my child to do what I want them to do?) – briefly, authoritative parenting means having a warm relationship with the child with a high degree of communication and responsiveness, effective limit-setting, and low coerciveness. She notes that the effects on child adjustment of other stressors that often accompany divorce are frequently mediated or moderated by the quality of parenting, and this seems to have really profound implications for divorced parents. What this says is that divorce isn’t necessarily going to screw up our kids for the rest of their lives. If you’re about to get divorced or have been divorced yourself, the first thing you might want to do to assess what you’re working with – take a look at which risk factors your child has. Did they have an inflexible, irritable personality before the marital problems became apparent, or have they always been generally easy-going? Are they at least of average intelligence? Overall, the more easy-going, intelligent children tend to be more resilient, although these characteristics are less important in predicting resilience than the mother’s parenting ability. Do you have supportive family around to provide a sense of continuity even as the nuclear family changes form? Do you feel as though you have the societal support you need, from the very practical child support and a job that pays your expenses, to a feeling of belonging in your neighborhood? These factors can help to support your own mental health which turns out to be the key indicator of resilience in children of divorce. We’ve seen that the economic decline that families face after divorce is associated with a variety of negative outcomes, so it’s important to try to minimize these to the greatest extent possible. The research does seem to indicate that it isn’t necessarily having money per se that is the critical factor, but it’s the things that money enables you to do, some of which could be achieved with less money if you think about them in creative ways. So when you’re choosing between two places to live, try to pick the more stable of the two – the one that will be less likely to require you to move again if you change jobs, for example. And when you think about providing educational opportunities for your child, try to see how you can do what you used to pay for, and get it cheaper or for free. So go to the free days at museums, and if your child is struggling in a certain subject at school, perhaps look for a high school student who might be willing to be a tutor rather than a far-more-expensive professional. And don’t forget about the myriad learning opportunities that are available for free in nature. So try to be like a parent who has money to spare, even if you don’t. You can also limit the amount of conflict that the child is exposed to, and preferably limit the amount of conflict the child isn’t exposed to, if that conflict has a negative impact on the custodial parent’s mental health. Because maintaining that mental health is key to the third and most important factor, which is keeping the kind of warm, supportive, authoritative relationship that will help the child to develop the interpersonal skills they will need to adapt to life after the divorce as well as be successful in their own subsequent marriage. It’s going to be harder to be a good parent after a divorce than it was before simply because the child may have a hard time adjusting; it can be difficult enough to be a calm, supportive parent in the face of one tantrum a week, never mind one tantrum a day. But do everything you can not to let it get to you; you want to try to avoid a cycle of negative reinforcement where your child’s poor mood puts you in a bad mood, which makes you short-tempered and punitive. Instead, try to set up a cycle of positive reinforcement where your own warmth and patience generate a warm response from your child, even though sometimes the limits you will necessarily set will still create the occasional tantrum. You can also try to encourage your child to spend time with other people who will attempt to teach your child how to build trust, manage emotions, and communicate effectively – interpersonal skills that will serve them throughout their lives, but especially in their own marriages later on. I hope this has been helpful to those of you who are approaching a divorce or have been recently divorced, and I look forward to wrapping up this mini-series soon with an episode on the impact of single parenting and remarriage on a child’s development. If you’re interested in the references for today’s episode you can find them at yourparentingmojo.com/divorce. Has the final episode in this series been released yet?